We are now finally on Instagram (@skylinefishingcharters)! We’ll be sharing plenty of photos and video throughout the upcoming season. For now, we’ve added quite of few photos of last season and before. Check it out and give us a follow! 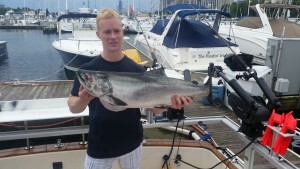 July usually brings hot, sticky weather and a lull in salmon fishing. 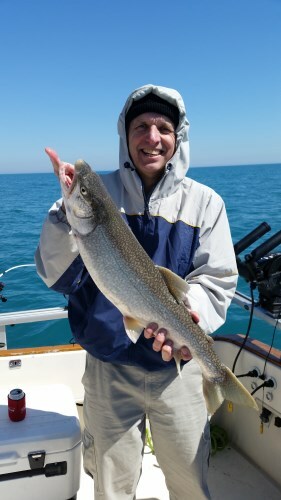 Lake trout are a more common target for mid-summer fishing in Chicago as the salmon have moved away after the spring run. 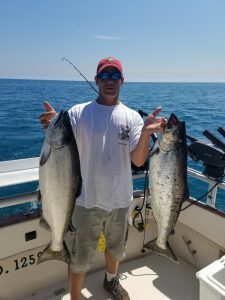 This year has been rather different, however, with a shorter salmon run in the spring and an abundance of all types of salmon (Coho and King) in July. For the last several weeks, the salmon have been schooling in 60 to 80 feet of water straight east of Belmont Harbor. It’s not uncommon for charters to return with 20-25 fish each trip. Just this last Sunday we caught 13 fish in just under 2 hours in a terrible sea state. Fishing for salmon can be pretty exciting at times with 2 or 3 rods going off at once as you pass a school of fish. These abundant salmon runs don’t last long though. 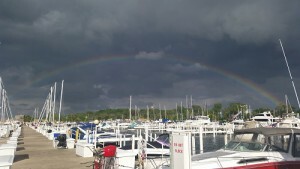 Fishing conditions can change at anytime. You can book your day now or give Captain Neill a call for more info. What’d You Catch On A Charter? The Great Lakes region is home to some great fishing with over three thousand miles of shoreline. The title question is one we get a lot from our customers during the year. We thought it’d be good time to provide a quick primer on the fish you might expect to catch when you book a charter. 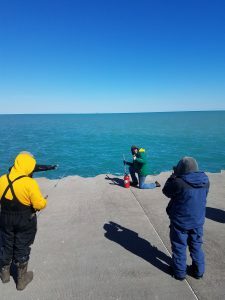 We target several species throughout the year with the Chicago fishing season generally running from April to October. King Salmon (or Chinook) are the ultimate Lake Michigan sportfish and are highly sought after. These fish are heavy and fight all the way to the boat. They congregate at stream mouths and shallow water during early spring and summer. They then sit near the bottom until the late summer spawning season. Their tail looks like a canoe paddle, and you can identify them by their teeth set in black gums. These cousins of the salmon are the only Lake Michigan species that will jump out of the water during a strike. These energetic fish will definitely make you fight to keep them as they dart toward the boat and then back away. It’s not uncommon to lose a good percentage of steelhead as their aggressiveness ends up in a lost fish. You can find them mainly in spring, as early as March, but they will bite all season. Their entire tail area is spotted and flat. This species is small yet abundant. 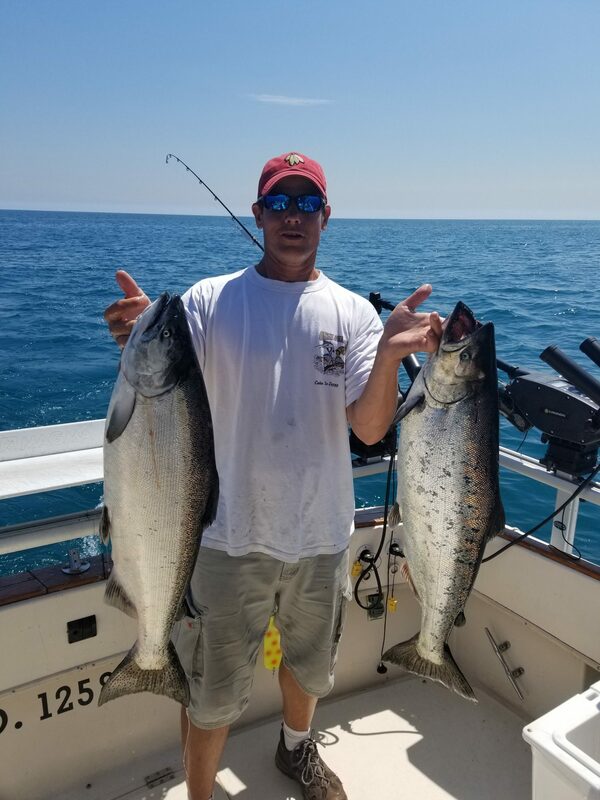 When you pass a school of coho, it’s not uncommon for 2-3 rods to go off at the same time. While they look like a steelhead, they are differentiated by their forked tail. These are near-shore fish and you can catch them by surf casting, pier fishing and shallow water trolling. Their mouth is entirely white (inner part) and have large large round spots on their back. Lake trout are the main indigenous species of Lake Michigan. They grow slowly but live much longer than their salmon neighbors. 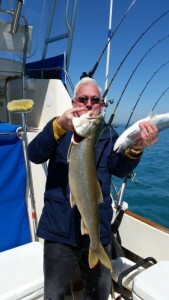 The average lake trout tends to be 8-15lbs with the big hauls being in the 20lb range. Some of these take over 10 minutes to bring in. We recently got a chance to do some early fishing near downtown Chicago with friends and family. 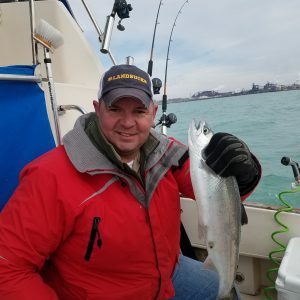 April is a great time to invite some friends out for a casual afternoon of fishing where we scout out a few locations to see where the different species of fish are biting. With the warm winter this year, we weren’t fishing as close to shore as in years past, but we were still relatively shallow at a depth of about 30-40 feet. We caught a good mix of salmon and lake trout, finishing with 7 lake trout and 6 coho salmon in just a few hours of fishing. We even caught two fish, a salmon and a lake trout, on the same rod at the same time! Successfully landing both fish in that situation is incredibly rare. 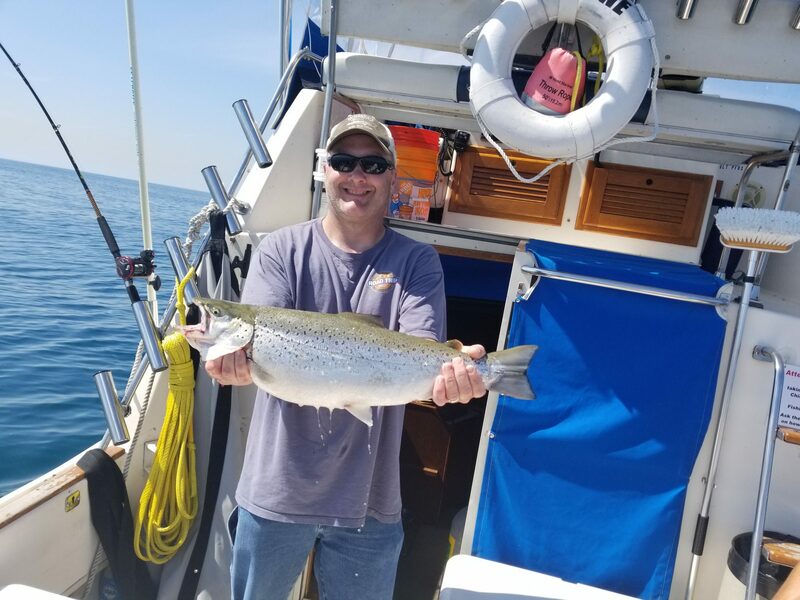 The lake is warming up quickly, and the fish are already starting to move to deeper water, but there’s still time to book your spring charter before the summer heat hits. 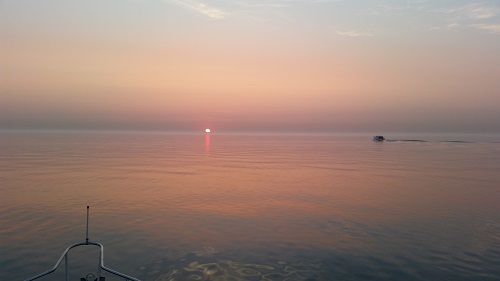 Charter Fishing Season At Last! The end of March is here, and the start of the Chicago charter fishing season is just around the corner! 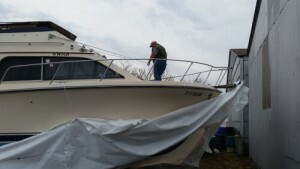 The boat was unwrapped from its winter covering a few short weeks ago, and the weather has cooperated enough to allow us to complete the long checklist of items to get the boat charter-ready. A lot has been added to the boat this year including a new aluminum hard top which holds a top-of-the-line 4G broadband radar. The delivered packaged hard top was stored with the boat this winter and just recently installed. It’s always a bit stressful drilling 4 big new holes into your boat! With a new hard top, comes new canvas. Our canvas guy measured and had the new stuff installed in less than a week! With the time ticking down until our first charter this weekend, we were able to cross the lake today under beautiful spring conditions. Discounted rates are still available for April and May. Email or call for more information. The early spring is the best time to snag those coho and king salmon. With the boat safely stored away a couple of months ago and our busy holiday season over, we can finally start the countdown to fishing season! We’ve invested in a new custom-made Atlantic Towers hard top for our charter boat. 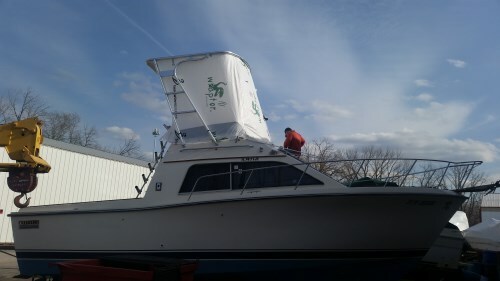 It’s sitting with the boat waiting to be mounted this March along with the new 4G broadband radar unit! According to forecasts, the El Niño affect looks to bring a more mild winter compared to recent years. 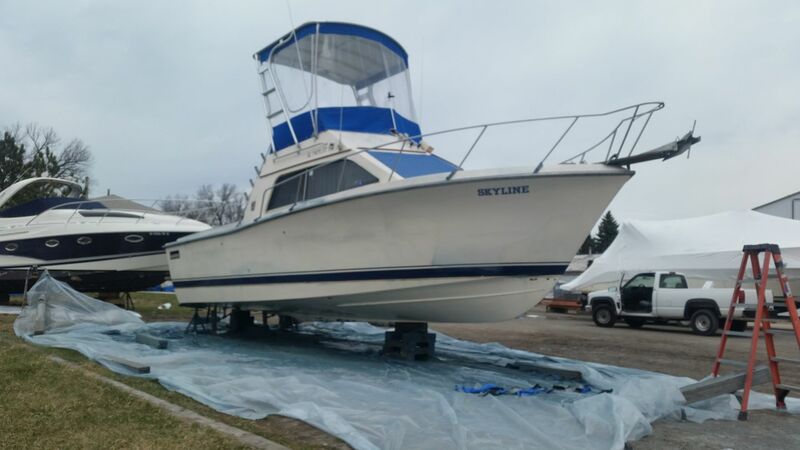 Hopefully this leads to no ice cover on the lake in March so that we can get the boat in early. 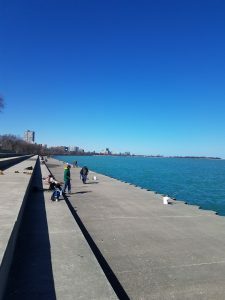 Chicago has an amazing coho salmon fishery in the springtime that we want to take advantage of as early as possible. 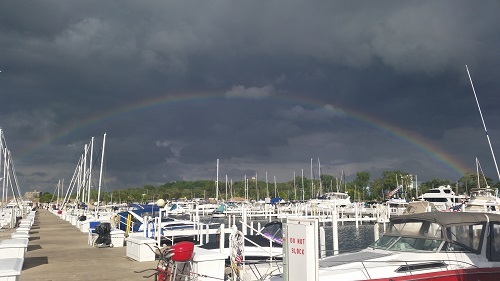 Until then, we will have to settle for the Chicago Boat show this weekend and the trade shows in February leading up to the start of the season. 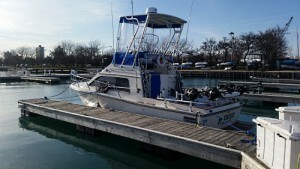 We have discounts for early-season fishing. Call or e-mail Captain Neill for discounted rates.